The 2005 Ashes series is memorable for many things. High quality cricket, memorable matches, some top-notch individual displays and of course, a fair share of controversies. Many English heroes were born, the likes of Kevin Pietersen, Freddie Flintoff and Andrew Strauss. 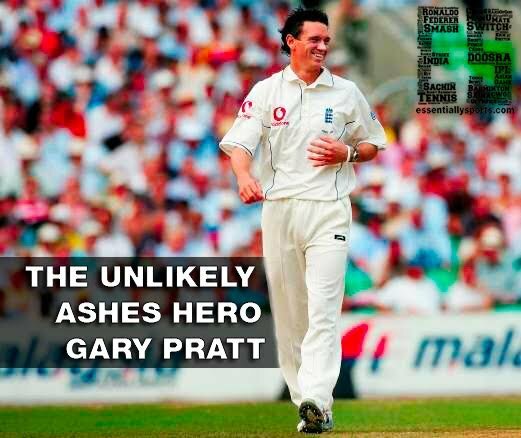 Another unlikely hero was a certain Gary Pratt, who changed the course of the fourth Test with a moment of magic. Who is Gary Pratt though? What did he do? Let’s replay the incident first. It was the fourth game of the series, which was locked at 1-1. Tensions were running high as Australia were batting for the second time in a row after being forced to follow on, trailing by 259 runs. In the evening session on day three, Damien Martyn and Aussie captain Ricky Ponting were fighting hard to reduce the deficit and give their bowlers a reasonable target to bowl at, with Ponting at his menacing best and looking all set for a big score. Simon Jones, the English fast bowler, went off the field with an ankle injury, and was subsequently taken to hospital for an ankle scan. While Jones was off the field receiving attention, Gary Pratt, a county-level player for Durham, was on the field as a substitute. He was standing at cover when Martyn prodded the ball in his direction and took off for a quick single. Pratt threw the ball toward the stumps at the keeper’s and hit them, with Ponting short of his ground, despite a full-length dive. The crowd went wild and Flintoff lifted Pratt on his shoulders in celebration. And as he walked towards the pavilion, Ponting expressed his extreme displeasure to Duncan Fletcher in the England dressing room, and alleged that England frequently used substitute fielders to keep their key bowlers fresh. Ultimately, it was concluded that Pratt was on the field owing to a genuinely serious injury to Jones and thus the substitution was not against the spirit of the game. England went on to win the game with three wickets in hand, and with the last match being drawn, this game at Trent Bridge meant that England took a decisive 2-1 lead in the series and would go on to win it. As the celebrations after the historic win took place, Pratt became a cult hero of English cricket. There was a spot reserved for him on the open-top bus during the victory parade, and also at 10 Downing Street. At the teams’ post-series get-together, Ponting even presented him with a pair of his boots, signalling that all was now well. Surprisingly, that was not the end of it. The Barmy Army even planned to fly Pratt to Australia for the 2006-07 Ashes as a good-luck charm, but failed to find sponsorship. In 2007, Pratt even finished in second place behind Ringo Starr, in a poll to find the No 1 substitute of all time. For all the love showered on him by the England fans, he was not liked too much by Australians. Michael Hussey, who was then Pratt’s captain at Durham, rang him up and said that he wanted him to play a one-day game up at Durham the next day. As Pratt drove down for the game, he wasn’t picked in the lineup by Hussey, and had to watch the game from the pavilion! Talk about an angry Aussie! So where is he now? Pratt is now a successful businessman, running a property development firm. He never got a call-up to play for England and his cricketing career came to an abrupt end in 2006 after Durham did not extend his contract. He even played some semi-professional football for Crook Town FC, before calling an end to his sporting career. “I just picked it up and hoped for the best,” said Pratt about THAT moment. “I could see about one-and-a-half stumps so was just hoping it would go in the right general direction.” It most certainly did, and made him a memorable part of English cricketing folklore. Next articleAston Martin looking for F1 come back with Red Bull?